Peller Estates’ winemaker Lawrence Buhler is always beaming with a smile from ear to ear, just like in the picture above. With good reason. 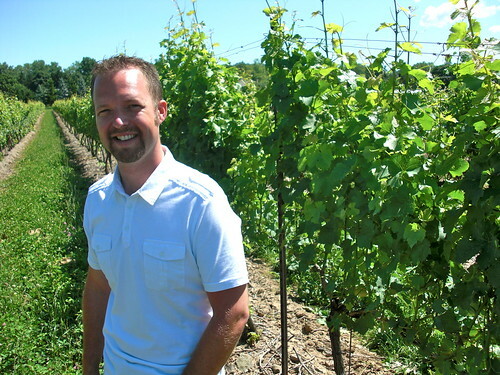 He presides over a dynamic portfolio of wines and works at one of Niagara’s most established and beautiful wineries. It is celebrating its 50th anniversary as a Canadian wine company this month in both Niagara and British Columbia, where the company first established itself as Andres Wines. Peller Estates, on a gorgeous piece of Niagara-on-the-Lake real estate, is the full meal deal with a large tasting room including multiple tasting stations, a wonderful restaurant, helicopter landing pad and surrounded by lush vineyards. Buhler makes some delicious wines through the various tiers at Peller, but it is with the Private Reserve and Signature Series where he truly gets to strut his stuff. Here are some reviews from the best of the new releases now available at the winery and at over 100 Vineyards Estate Wines stores in Ontario (also with good representation at the LCBO and Vintages). Peller Estate Signature Series Ice Cuvee Classic ($32, 92 points) — Peller has perfected the art of blending in a dosage of about 15% of Vidal icewine to traditional method sparkling wine (made with Chardonnay and Pinot Noir grapes). The result is a decadent bubbly with crisp apple, tropical fruits, bread yeast, vanilla and sweet aromas. It’s lovely on the palate with a smooth texture, apricot fruit, apple and citrus all delivered with a nice, sweet wet kiss of wild honey. This is a non-vintage wine that maintains the style vintage to vintage. 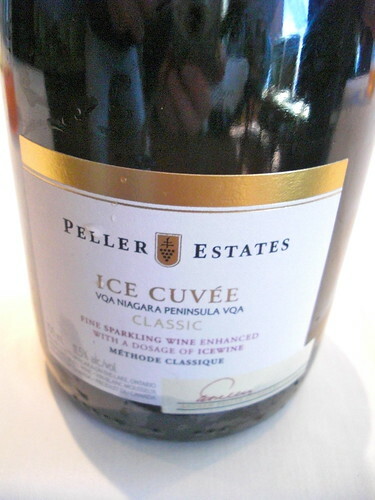 Peller Estates Signature Series Ice Cuvee Rose ($35, 93 points) – Made in the same manner as the above wine but part of the main blend includes 10% Cabernet Franc and a dosage of Cabernet Franc and Vidal icewine added in. This is such a magical wine with strawberry, citrus, watermelon, raspberry, spice, honey and toast on the nose. Simply delicious in the mouth with a sweet, vigorous bead of bubbles, lush red fruits of raspberry and strawberry and just a kiss of sweetness to balance out the acidity. Peller Estates Private Reserve Chardonnay 2009 ($19, 88 points) – From the Dueck Vineyard in Niagara-on-the-Lake and barrel fermented, barrel aged in older oak for 12 months. It shows apple and citrus fruit with subtle oak and spice. A nicely balanced wine in the mouth with harmonious fruit, spice and acidity. Peller Estates Signature Series Chadonnay Sur Lie 2009 ($30, 91 points) – I thought the 2008 version of this top Chard from Peller was pretty good, but this vintage tops it. The fruit is barrel fermented and aged sur lie for 12 months in French oak, 40% of the barrels new. Only 38 barrels were made. It’s quite pretty on the nose with pear, apple, toasty vanilla and roasted hazelnut notes. It’s creamy on the palate with gorgeous oak tones to go with pear, citrus, apple fruits and touches of nuts and clove-vanilla spice. Tasty and age-worthy. 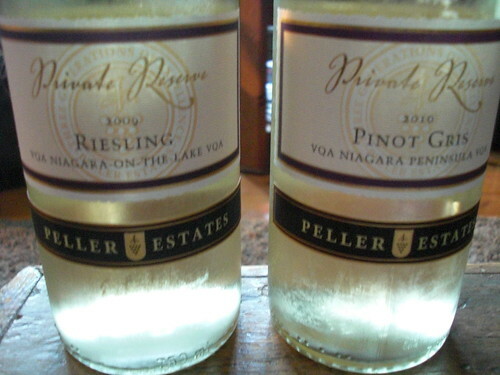 Peller Estates Private Reserve Riesling 2009 ($17, 89 points) – Sourced from fruit grown in the Niagara-on-the-Lake Huebel and Wiens Vineyards, this is essentially a dry Riesling with floral, lime, lemon and peach aromas on the nose. The palate reveals zippy-zesty grapefruit, lemon, quince and mineral notes. Very nice refreshing style. Peller Estates Private Reserve Pinot Gris 2010 ($19, 87 points) – Notes of melon, tropical fruit and apples on the nose of this Gris that sees a small portion of the grapes aged in older oak barrels for five months. It’s soft and fleshy on the palate with baked apple pie, peach and melon fruit with a lovely spice note. Peller Estates Private Reserve Gewurztraminer 2010 ($17, 86 points) – An aromatic nose of summer roses, grapefruit, lychee, clove and tropical fruits. It’s plump and juicy on the palate with a long finish. Andrew Peller Signature Series Sauvignon Blanc 2010 ($30, 91 points) — A dramatic followup to the gorgeous 2009 vintage. Rich, bold aromas of tropical fruit, grass, sweet herbs, vanilla and wild spices from partial wild fermentation. This is a textured, layered, weighty SB with fleshy fruits, concentrated flavours of grapefuit, mango, pear and citrus with exciting herbs and grassy notes in the background. Peller Estates Private Reserve Rose 2010 ($18, 87 points) — A lighter style rose made from 100% Pinot Noir. Shows refreshing red berries from the nose to the palate. Peller Estates Private Reserve Gamay 2009 ($19, 88 points) — A smoky, roasted meat and dark fruit nose on this rustic red. The palate reveals more dark and juicy fruits and spice through the finish. Peller Estates Signature Series Cabernet Franc 2008 ($38, 92 stars) — Peller only made one Signature Series red wine in 2008 and this is it. The fruit for this Cab Franc spent 20 months in 50% new French and American oak. It shows wonderful black cherry and currant fruit on the nose to go with vanilla, a touch of roasted herbs and spice. Love the fruit that’s beginning to open up.